In our year-long quest of finding out the best things to do around Lake Garda, how could we say no to diving? 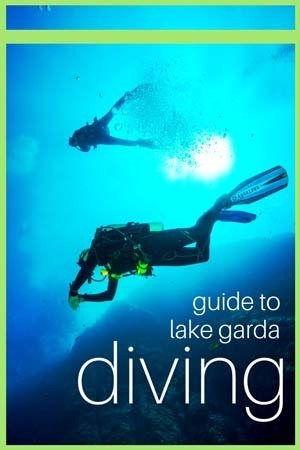 Here’s all you need to know about diving Lake Garda, including dive site description, what to expect and where to stay! I first thought about diving Lake Garda last April, when we headed there to hike a stretch of GardaTrek, that ended up being the most scenic hike around Lake Garda we’ve ever done. The night before the hike, we had dinner at Aqua, one of the best restaurants in Torbole near Riva del Garda, famous for its delicious freshwater fish specialties. We were served a dish called carpione as a main, an endemic Lake Garda fish that is a kind of cross-between a salmon and a trout, and lives at the bottom of the lake – up to 250 meters deep. How does diving Lake Garda look? Up until that point, I hadn’t realised that the silver-turquoise waters of Lake Garda (depending on which way the wind blows) could be so deep. Of course, that made us wonder what lays beneath. 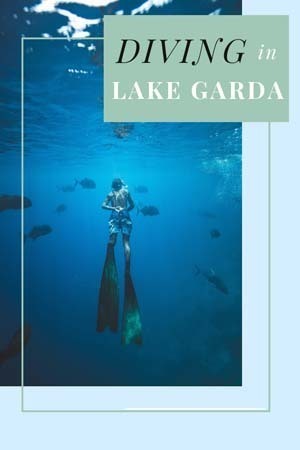 We’re both certified divers, and we’ve had wonderful diving experiences over the years – diving with thresher sharks in Malapascua, with great whites in Australia, exploring cenotes in Mexico – but when it came to diving Lake Garda, we really didn’t know what to expect. Here’s how we found ourselves standing in a car park one chilly October morning, trying to squeeze our bodies into thick 7 mm wetsuits. The previous day was sunny and glorious, and we spent it mountain biking around Lake Garda, but the weather had changed – heavy clouds were stacked all over the mountains, and the peler morning wind blew fast and steady, making the lake waters look like melted steel. We would be diving Porto San Nicolò, perhaps the most ‘iconic’ Lake Garda dive site, located right opposite the marina of the same name in Riva del Garda. The dive site is roped off with buoys, providing protection from the incoming boat traffic. Another benefit of Porto San Nicolò is that access to the dive site is quite close to the car park (about 100 meters walk), meaning you won’t have to lug equipment too far. It was a windy day, with waves and a little current on the surface, so we had to pay attention when getting in – but soon we were underwater, swimming past a steep rock wall extending 80 meters into the abyss. Visibility was about 5 meters, pretty good in ‘lake terms’ – probably a bit disappointing if you’ve been diving in places like Raja Ampat. We swam along the wall for a bit, completely covered by thousands of tiny shells, and strangely enough, visibility improved as we went deeper. 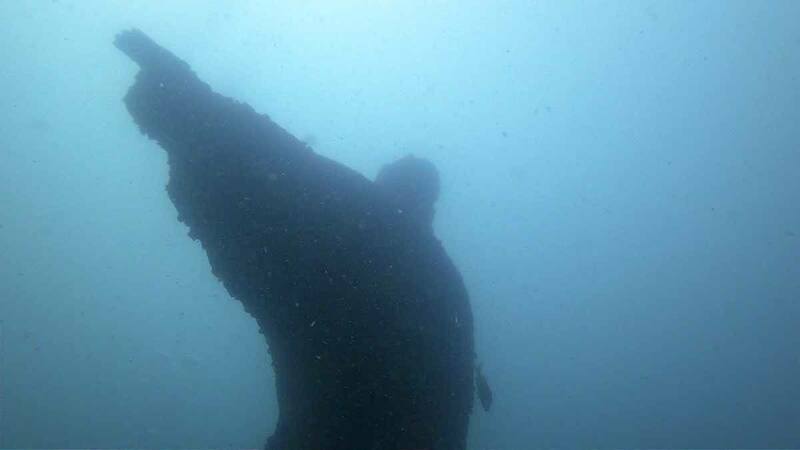 The, we followed a line and turned back, heading towards the dive site’s prime attraction – the Silent Christ, a giant statue by local artist Germano Alberti located 15 meters deep, a ghostly figure surrounded by deep blue waters, and covered by dressene, tiny lake shells. 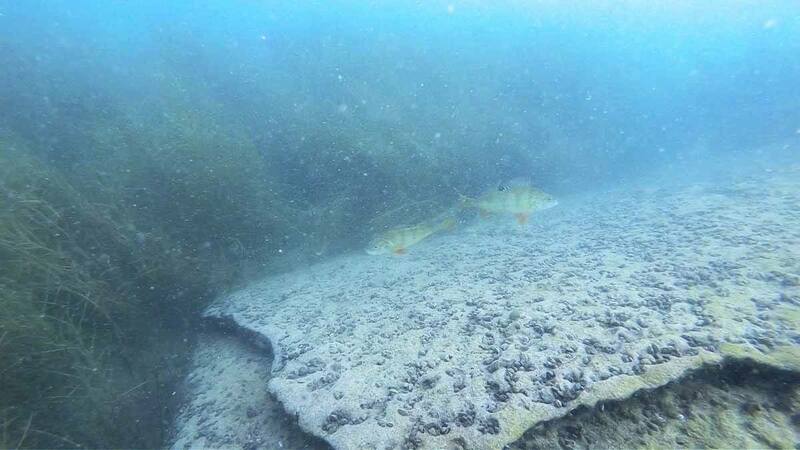 We had our safety stop at 5 meters, in a sandy spot with plants and fish floating about – perch with colourful markings on their skin, pockmarked burbot and even a couple of huge tench in the distance. Diving Lake Garda was incredible. It was our first lake dive, and we didn’t really know what to expect – we were all surprised by the variety of things to see underwater, from small cracks in the rock hiding miniature caves, to sandy flats and the sheer cliff, not to mention ‘man made’ stuff like the Christ statue and a large pipe, slowly being reclaimed by the lake ecosystem. After Christ, you need to come back and see the Madonna! 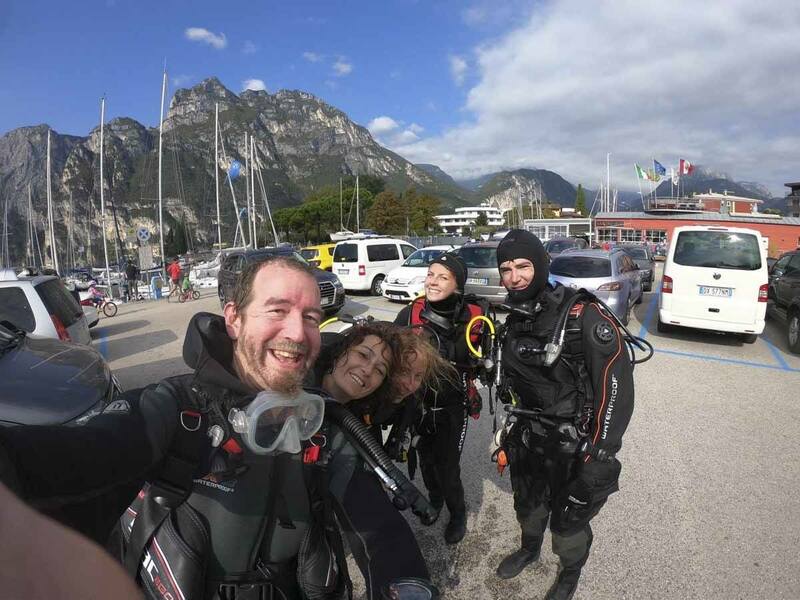 That’s how our great divemaster Alessandra said goodbye to us – and so I added diving Tempesta to my ever-growing list of things to do in Lake Garda. The Tempesta dive site is about 3 km south-east of Torbole, next to the hamlet of the same name. Access is by a small garden, and after descending 15 meters to a statue of the Virgin Mary, advanced divers can keep following a line to a 40 meter-deep rock amphitheatre, with rock cracks and formations attracting a variety of fish. The amphitheatre reaches 80 meters depth, making this site ideal for advanced and technical dives. Visibility is also excellent, in excess of 40 meters on a clear day. This is the best dive for beginners in Lake Garda, and it is often visited by dive schools and people doing PADI certification courses. Access is from a beach just to the other side of Mount Brione from Porto San Nicolò – it’s a longer walk to the dive site, but it’s doable. 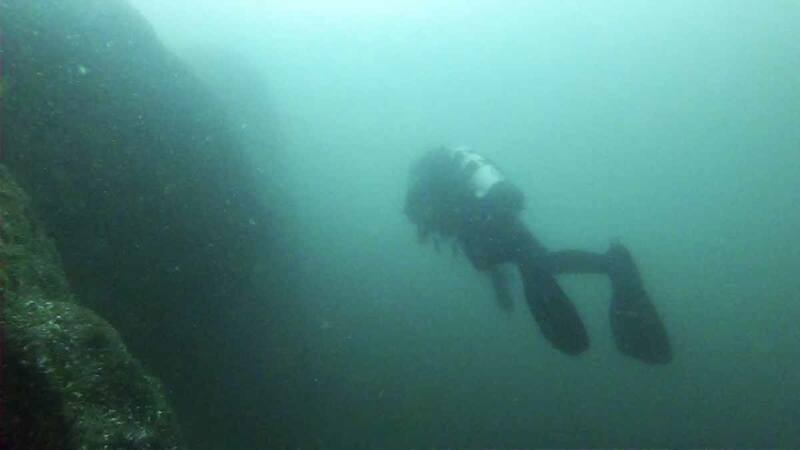 The lake is not as deep as at Porto San Nicolò so the visibility at Baia Azzurra is usually poor for the first few meters, but then it improves once you hit 5 meters depth, where you’ll find a line to follow and a platform ideal for diving exercises. This is the westernmost dive site in Lake Garda – access is in Riva del Garda, not far from the first tunnel of the Gardesana Occidentale state road. You’ll need to walk down a path about 50 meters long, a little steep towards the end. Our divemaster Alessandra says hi! 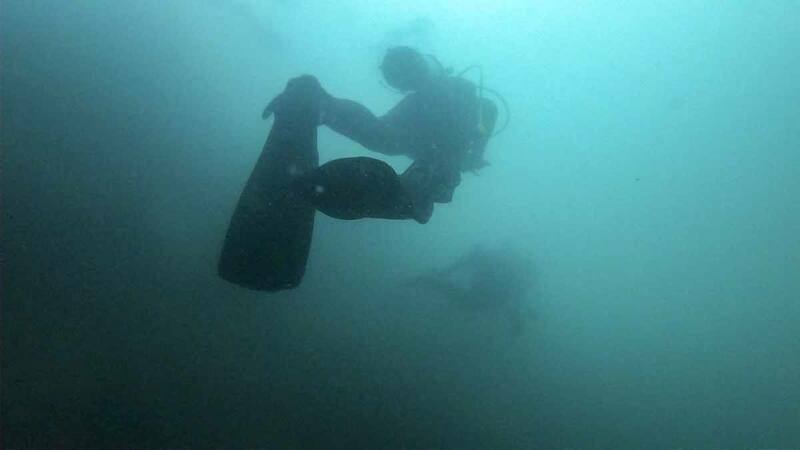 The lake gets deep fairly quick, with lots of rocks and underwater plants, before reaching the most interesting part of the dive site around 15 meters deep, with rock walls, boulders and even a bicycle chained to a rock. This dive site sees fewer tourists compared to Porto San Nicolò, and it’s really worth visiting! What’s the best time to go diving in Lake Garda? 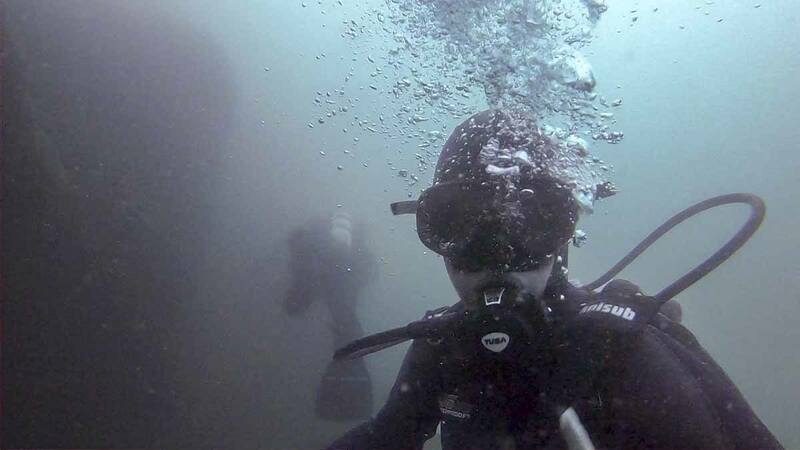 The best times to dive Lake Garda are Spring and Autumn, when temperatures are bearable and visibility is good. In summer, the lake is warm but visibility is poor due to algal bloom and to the sediment carried into the lake by the River Sarca, whereas in winter visibility is best, but the lake is too cold to dive with a wetsuit (unless you’re a Viking). What temperature is the lake going to be? 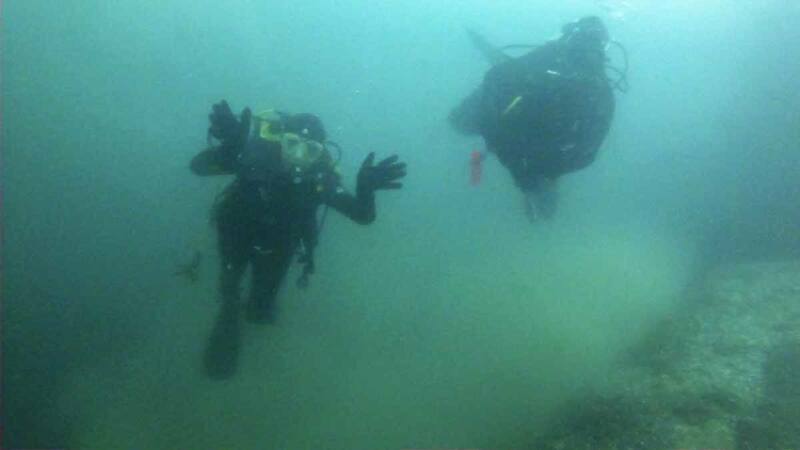 The day of our dive, water temperature was 19°C, which is normal in September/October. The temperature then decreases throughout November and December to reach approximately 8-10°C in winter – warmer than air temperature, even though it rarely gets below zero around Lake Garda. 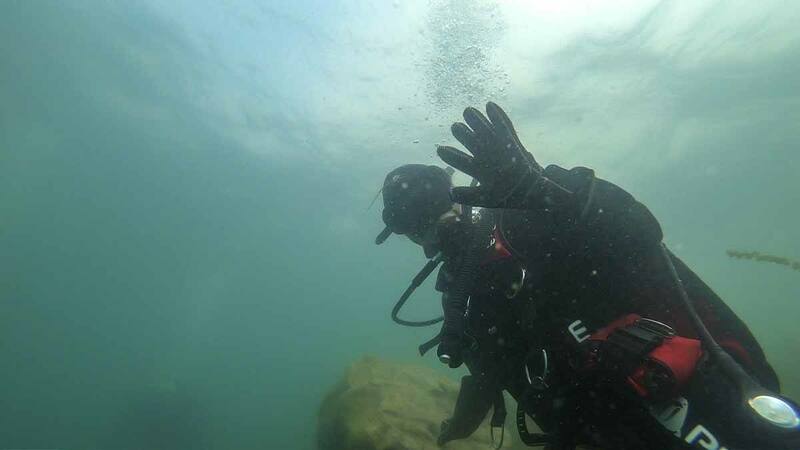 You’ll need warm gear to dive Lake Garda, especially in autumn/winter! 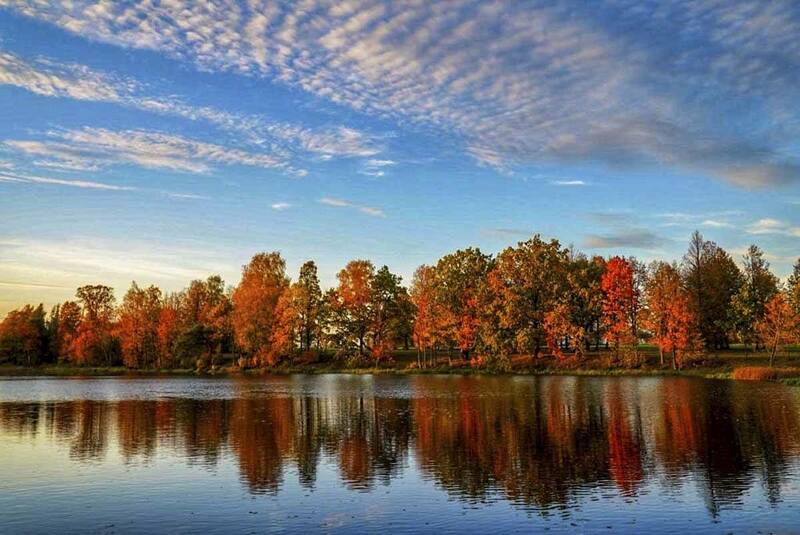 The lake is at its coldest between December and February, then it warms up again all through Spring, when the water is around 15-17°C. In summer, water temperatures over 20 and even 25°C are not uncommon. What equipment do you need to dive Lake Garda? Besides standard diving equipment like a BCD, tanks and the like, we recommend diving with a full 7 mm wetsuit with hood. 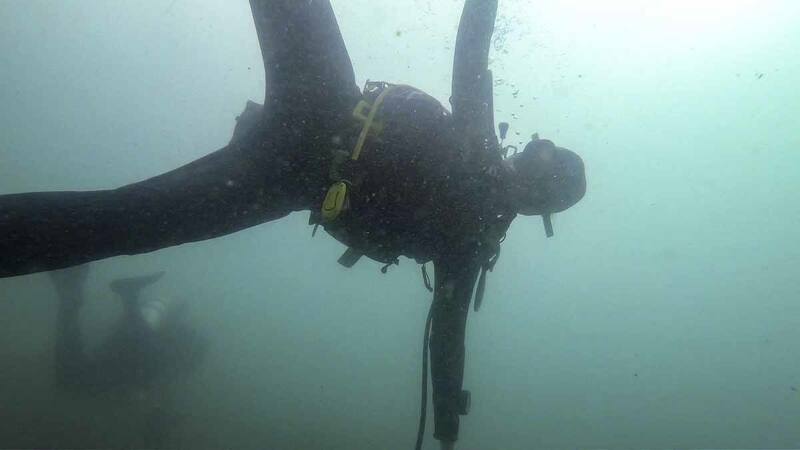 It was perfect for the water temperature during our dive. You’ll be even more comfortable with a drysuit, but these require extra certification. What’s visibility going to be like? Ok, please don’t forget you’re not in the Philippines! 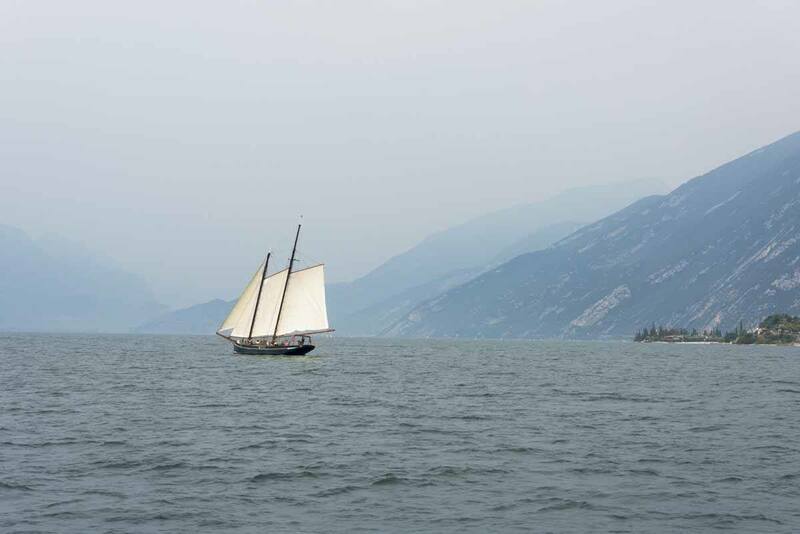 Visibility in Lake Garda can vary due to a number of factors including wind, weather, algal bloom and sediments from the Sarca river. We had about 5 meters visibility, which is normal – even good, we were told. 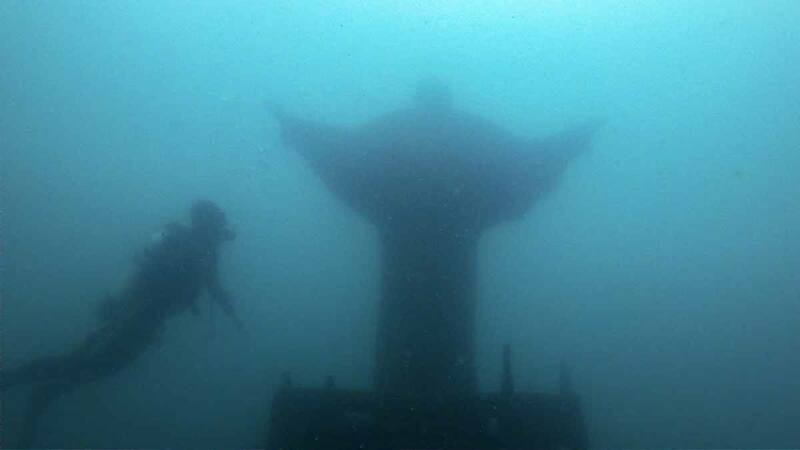 Sometimes visibility is so bad you end up bumping into the statue of the Silent Christ, other times you can see 30 meters or more. Generally speaking, visibility is inversely proportional to water temperature. Why do I need to walk to Lake Garda dive sites? All around Garda Trentino, the northernmost shore of the lake – which also happens to be where the best Lake Garda dive sites are located – it is forbidden to dive from a boat. This leaves you with no alternative but to walk. Can I get my PADI certification in Lake Garda? Of course! Lake Garda actually a really good place to learn according to our divemaster. If you want to get your PADI certification in Lake Garda, check out the GardaTrentino site for info on dive schools. If you’re lucky, you’ll get to dive with Alessandra, who is a wonderful guide! Thanks again to Alessandra and Martina! We recommend choosing Riva del Garda or Torbole as a base to enjoy the best Lake Garda adventures! 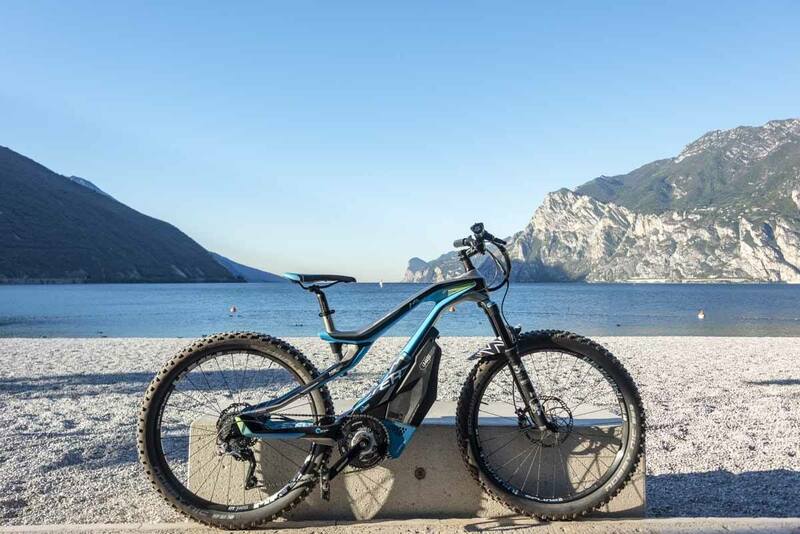 Everything is either a walk, quick bike ride or quick drive from Torbole and Riva – including diving! Here are some of our favourite outdoor-focused hotels in Torbole and Riva! Hotel Rudy – great budget-friendly option in Riva!